Audi’s forthcoming A8 will feature an ‘intelligent mix’ of four materials that will be used to create a body that is lighter but stronger. Aluminium, steel, magnesium and carbon fibre-reinforced polymer (CFRP) will be used to produce a bodyshell that increases rigidity by up to 24 per cent. The company might already have built in excess of more than one million production cars using its Audi Space Frame (ASF) process, but there has never been anything quite as innovative as the latest incarnation of the A8. Which brings us to the central nervous system of all that; the Audi Lightweight Design Centre (ALC), which was established back in 1994 and has been a hotbed of patent production ever since. Currently, it’s home to around 200 specialists, with a core of 25 or so working exclusively on fibre-reinforced polymers. However, the centre isn’t just interested in working with new materials, it’s also obsessed with joining them together in innovative new ways too. The ALC has also been a pioneering department in the use of material mixes and by blending the aforementioned four, Audi has found what it thinks is the near perfect cocktail for construction. For example, there’s a carbon rear panel behind the back seat of the A8 that contributes 33 per cent to the torsional rigidity of the whole vehicle. However, to look at, it comes across as almost insignificant, until you understand what goes into its production. To create this incredibly strong component, Audi fuses between six and 19 fibre layers in a sort of super-strength sandwich and produces the panel from that. Innovative direct-fibre-layering machines let the manufacturer produce the panel whilst bypassing the need for producing sheets of carbon fibre in between. It’s a much faster process as individual epoxy resin-layered panels are cured within mere minutes. Elsewhere, hot-formed steel components such as the lower section of the front bulkhead, side sills, B-pillars and the front section of the roof line are carefully tailored in terms of thickness to increase strength, but also reduce weight wherever possible. The aluminium surface, meanwhile, makes up 58 per cent the shell of the A8 and, without paint, is very good on the eyes. Meanwhile, flourishes like the magnesium strut brace in the engine compartment, offers up a 28 per cent weight reduction compared to earlier variants. Even more impressive though is the way all of these component parts are produced in such a seemingly sterile environment. Admittedly the factory itself is new, but you feel almost embarrassed to set foot on the shiny off-white floor, which looks almost as clean as the plates Audi serves its buffet lunch on. There might not be too many people present on the shop floor, but there are Kuka robots aplenty and they’re running through their moves without any production parts in a process called the ‘Ghost run’. They’ve designed and built cars here for years of course, with the Neckarsulm plant and the other facility in Ingolstadt being Audi’s main manufacturing hubs in Germany. But, for the new operation there has been expansion, with 14,400 tons of steel needed for construction of the 41-metre high body shop. That, Audi points out, is twice as much steel as was used for the Eiffel Tower in Paris and the extra space is being put to good use. Audi employs a total of 14 joining processes to create the body of the A8. 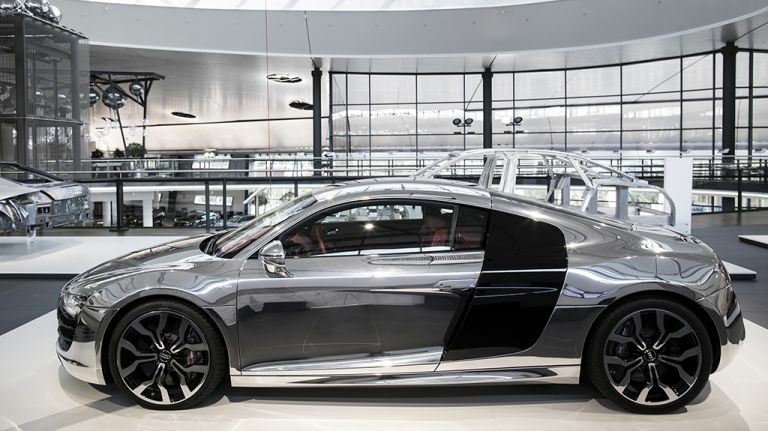 There’s roller hemming, which is used to complete the front and rear door cutouts, there’s grip punch riveting and, most impressive of all; remote laser welding of aluminium, which Audi says is a first from any automotive manufacturer anywhere in the world. The process uses a laser guided weld line, allowing ultra-precise joins and a finished piece that isn’t even hot to the touch immediately afterwards. It’s better for the environment too, with Audi stating that the process reduces Co2 emissions by about one quarter. Indeed, the plant has been designed and laid out with maximum efficiency in mind. Every production detail has been prodded and poked, then tweaked to make it better than before. Spot welding tongs are powered by electric motors, thereby weighing 35 kilograms less than their predecessors. That means Audi can use smaller robots, which in turn use less electricity and this reduces operational costs as a result. And, with around 500 robots on site, adding up these savings can mean a plant that has drastically reduced its carbon footprint. The robots have also been engineered to be more adaptable and can be repurposed to carry out several steps in the construction process. With 90 adhesive systems, 60 machines for self-tapping screws, 270 punch riveting systems and 90 resistance spot welding tongs, the whole setup covers three production levels in all. One level of the factory alone covers 50,000 square metres, which is the equivalent of no less than seven football pitches… Yep, it’s a bit big.